Sponsor spotlight: Rubber City Vintage Cycle. News | 2:35 pm by MatthewM | Comments Off on Sponsor spotlight: Rubber City Vintage Cycle. There is a lot of diversity in the power sport and motorcycle community, but one thing we share is an understanding of how important it is to have folks that stand up for your right to ride. Street, dirt, track, trail, we all face the same or similar threats. So I personally am not surprised that a shop who’s target market is the vintage street rider is still willing to step up and sponsor an off road organization. Perhaps because being surrounded by all that moto history is a good reminder of our shared roots and how long efforts to protect the sport have been going on. It may also help that one of the owners, Kevin, is a naturally helpful guy. I first met him several years ago on an internet forum while looking for help with a vintage project. Having never met me before he volunteered to loan me an old hard to find service manual. This was before RCVC existed, and even then it was apparent Kevin liked old bikes, and everything that went with them; even the “joys” of maintaining them. I lost touch for a few years, until I heard Kevin and a partner had opened Rubber City Vintage Cycle. Trust me, it takes a special kinda guys to have more passion than frustration for the old stuff, especially when you make it your business. For the last few years the RCVC crew has been building a reputation in N.E. Ohio for being a great resource for owners of the classics. As parts like gas tanks and exhausts for these older bikes get harder and harder to find these are the guys you want to know if you are contemplating restoring that barn bike. Besides parts (and parts, and parts), they have also been know to have whole bikes for sale. You know, just in case you need a restoration project (who doesn’t?). 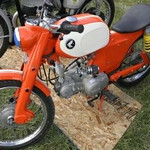 Although there are also the lovingly taken care of bikes that are ready to ride, like this old Honda Cub. Who wouldn’t want to have something like this for short rides around town? Or check them out their Ebay Store. Although they are “vintage” they do participate in social media, and put the occasion pic of Kevin being “Special” on the Rubber City Vintage Cycle Facebook page. OMTA receives Yamaha OHV Access Initiative Grant! ODNR acquires property for trail expansion. Ohio Department of Natural Resources conducting survey. Welcome to Perry Forest APV Area Trail Riders! © 2019 Ohio Motorized Trails Association. All rights Reserved.